Chief Justice Dr. Shirani Bandaranayake and her husband National Savings Bank (NSB) Chairman Pradeep Kariyawasam are at the center of a scandal again. While Justice Shirani Bandaranayake sat on the Bench of Sri Lanka’s apex court, her husband Pradeep Kariyawasam was an unsuccessful man working in the marketing field. In June 2009 following a Supreme Court order to the Treasury Secretary to appoint a Board of Directors to the Sri Lanka Insurance Corporation (SLIC) after the government took it over, President Rajapaksa who is also the Minister of Finance, appointed Justice Shirani Bandaranayake’s husband Pradeep Kariyawasam to the new SLIC Board as its Chairman. Herein lies the rub. The names proposed by President Rajapaksa for the new Board of Directors for SLIC received Supreme Court approval after the list was presented to Court by Deputy Solicitor General Sanjaya Rajaratnam on 26 June 2009 on behalf of the Treasury Secretary. But Kariyawasam’s good fortune did not end there. He was also appointed to the Lanka Hospitals Corporation PLC as a member of its Board of Directors along with Defence Secretary and Presidential sibling Gotabhaya Rajapaksa who was appointed Chairman. But that is not all. On May 15, 2010 Pradeep Kariyawasam was also appointed Chairman of the National Savings Bank by President Rajapaksa. The NSB controls assets worth Sri Lankan Rupees 424,994,303,000/-. Now under her husband’s chairmanship, the NSB has evolved a “Sophisticated bank robbery”; the questionable Rs. 390 million deal between the National Savings Bank and a group of investors of The Finance Company (TFC). During an interview with Mirror Business, The Finance Company PLC (TFC) Chairman Preethi Jayawardena and TFC Director/Chief Executive Officer Kamal Yatawara reiterated that the transaction in question was strictly a private one between the owners of the shares and the NSB, thereby having no material impact on TFC or its depositors. According to them, this corrupt transaction is not even a transaction between two state run organizations. It is a private deal between two cronies and the NSB. Good Governance and Minority rights activist K. C. Vignarajah told The Island Financial Review: “The deal was suspicious from the very start …The management of the NSB should be held accountable to the public, no matter how small the transaction may seem to them. Some had argued that the President cannot prevent the payments from being made on technical grounds, but if the deal was suspect there is nothing wrong with preventing those responsible from getting away with the loot, especially when it is public money”. The Ceylon Chamber of Commerce issuing a statement called for an impartial inquiry and urged authorities to take action against any wrongdoers. “The Ceylon Chamber of Commerce (CCC) notes with concern the recent transaction of approximately 13 percent of The Finance Company PLC. The Chamber believes that ensuring integrity and transparency are vital to maintain investor confidence in the Colombo Stock Exchange (CSE) for the capital market to remain robust,” the Chamber observed. Opposition lawmaker and leading economist Dr. Harsha De Silva said, “This transaction exposed only the tip of the iceberg. There is a mafia in the country’s Stock Exchange and this deal has exposed a few of them and we are not going to let go. We hope the Regulators find the courage to carry out an investigation and give a fair judgement. If they do this, it will have a positive impact on the Colombo Stock Exchange, the inflow of foreign investments and the overall development of the country”. Alluding to the deal as a ‘sophisticated bank robbery, Dr. Harsha De Silva said the country needed sophisticated law enforcement officers and regulators to tackle such fraud. Dr. De Silva called for the resignation of NSB Chairman Pradeep Kariyawasam and said authorities should be allowed to carry out an impartial inquiry and punish any offenders without fear and favour. Now, I must say the resignation of NSB Chairman Pradeep Kariyawasam is not enough, his wife must also resign! How can any investigation be carried while his wife sits as the Chief Justice? The government has already announced that it has appointed a committee to investigate the matter. At the end of the day any findings will go to the Supreme Court for a decision. We do not need to go for India or to the west for best practices. Sri Lanka already has a good example. When the husband of the head of the Bribery Commission Nelum Gamage was allegedly involved in corruption, she resigned. She was a respected civil servant. When the then President D. B. Wijetunga had asked her to close the corruption investigation file related to the then General Manager of the Railway Department W. A. K. Silva, she put a note regarding the President’s request. She was a lady of integrity. After the Bribery Commission was established under President Chandrika Kumaratunga, Nelum Gamage was appointed as its first Chairperson. Unfortunately her husband was allegedly involved in corruption, so she resigned. We must ask Chief Justice Dr. Shirani Bandaranayake to follow Nelum Gamage’s example!Like all Chief Justices since President J. R. Jayewardene’s 1978 Constitution, Shirani Bandaranayake’s too was a direct appointment by the President. That then is not the point. What is however important is that none of the spouses of previous judges have accepted political appointments. The Chief Justice is automatically the Chairperson of the Sri Lankan Judicial Service Commission. This means that, effectively, she is the boss. While much of the work is delegated to others, it is the Chairperson who is ultimately responsible for the “corporate culture” in the operations of any organization. This is how organizations operate on a psychological level. The leader sets the tone. 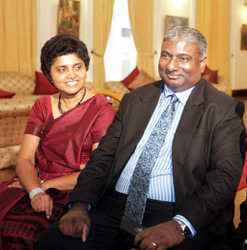 The relationship between the Chief Justice of Sri Lanka and her spouse cannot be private. Not when that spouse holds key positions in government institutions that is a conflict of interest. A conflict of interest is also corruption. It is worthwhile quoting Dr. Colvin R. De Silva when he said, while participating in a no confidence motion against then Prime Minister Sirima Bandaranaike, “the service exacts from itself a higher standard because it recognizes that the state is entitled to demand that its servants shall not only be honest in fact but beyond the reach of suspicion of dishonesty”. Pradeep kariawasam it appears cannot tie his shoelaces at 400lbs.I want to ask him what [Edited out] position he likes best.The Rajapakse junta knows to tap the economic sap, it is in their genes.When will the ignorant voter ever learn.